Obamacare Rollback Bill Would Replace Subsidies With Tax Credits : Shots - Health News The plan would replace insurance subsidies for low-income families with tax credits for everyone, eliminate the requirement to buy health care, and end taxes on medical devices. 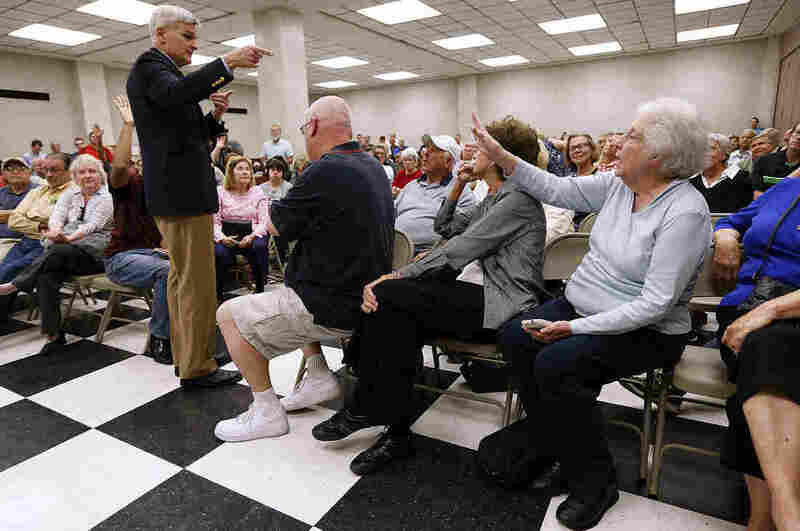 Sen. Bill Cassidy, R-La., responds to constituents concerned about their coverage under the Affordable Care Act. In recent days, several Republican lawmakers have faced crowds of constituents at town hall meetings around the country who are angry that they may be in danger of losing their health coverage. A GOP draft bill, recently obtained by Politico, would likely do little to assuage these concerns. The Feb. 10 document follows the broad policy outline released by Republicans last week just before they went home for a Congressional recess. It proposes cuts to federal payments to states that have expanded Medicaid and offers tax credits for people to buy health insurance. "This would mean fewer people could afford health insurance and that the health insurance would likely cover less," says Larry Levitt, senior vice president at the Kaiser Family Foundation. Under the plan, states that expanded eligibility for Medicaid would see their supplemental federal funding rolled back. The program would also be converted from a federal-state program that pays for all the health care beneficiaries get, to one where Washington sends a fixed amount of money to each state for each Medicaid enrollee. To help people who don't get insurance through their employer buy coverage, the bill offers age-based tax credits that start at $2,000 for individuals under age 30. It would rise to $4,000 for those over 60. Those credits are unlikely to cover the full cost of a plan that pays for routine health care, but could potentially pay for insurance that protects against a catastrophic health event. Levitt says those credits are less generous than the subsidies offered under Obamacare. The draft bill is consistent with what Republicans have been saying they want to see in place of Obamacare, says Rodney Whitlock, vice president of health policy at ML Strategies. "No surprises here," says Whitlock, who was formerly the Republican health policy director for the Senate Finance Committee. "These are all ideas Republicans have championed. Now the Congressional Budget Office will decide if they agree." The Congressional Budget Office will "score" the ultimate bill, estimating how how many people it's likely to cover and its impact on the federal budget. Spokesmen for the House Energy and Commerce, and Ways and Means committees, which are drafting the legislation, declined to comment on the leaked bill. It's not clear that the details in the two-week-old draft bill, such as the size of the tax credits, are still being considered. One House staffer says lawmakers are testing different scenarios with the Congressional Budget Office, comparing cost and coverage levels, and fine tuning the legislation. The draft bill would also get rid of the taxes created under the Affordable Care Act, including taxes on medical device makers and health insurers. Instead, it would limit how much employers can deduct for expensive insurance policies they give to their workers. It would also eliminate the mandate for individuals to buy insurance. The bill attempts to encourage healthy people to buy insurance by mandating that they cannot be charged more for existing medical conditions, or, once they get sick, if they maintain continuous coverage. People who elect not to buy insurance at the outset would pay a surcharge when they do, and could end up paying more if they've been ill.
Levitt is not convinced the Republican's continuous coverage plan would work. "Republicans are struggling to find the Holy Grail of how to get healthy young people to buy insurance," he says. "I'm not sure they've found it here, but it's a legitimate struggle." Senate Democrats denounced the proposal. "This isn't a replacement, it's a recipe for disaster," says Senate Democratic Leader Charles Schumer, N.Y. "Republicans are determined to put insurance companies back in charge, make health insurance more expensive for millions of Americans, restrict women's access to vital health services by by defunding Planned Parenthood, shift costs to states and dismantle Medicaid, while kicking millions more off of their plan."